Washington (CNN) The former director of the US Office of Government Ethics plans to file a second Hatch Act complaint against White House counselor Kellyanne Conway, after she appeared to defend GOP Senate candidate Roy Moore of Alabama and speak against his competitor on TV. Walter Shaub, who served as ethics director under the Obama administration, is filing his second Hatch Act complaint in a month against Conway. According to a draft shared with CNN, the complaint argues that Conway likely violated the Hatch Act after appearing to endorse Moore while appearing on CNN’s “New Day” on Wednesday morning. The Hatch Act prohibits White House officials from advocating for or against candidates, even in media interviews. The complaint will be filed by the nonprofit Campaign Legal Center. 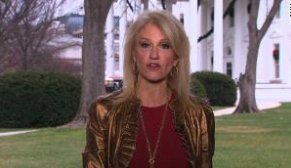 During her interview with Chris Cuomo, Conway spoke openly about the President’s endorsement of Moore and negative feelings about his opponent, Democrat Doug Jones. At times she appeared to add her own opinions of Jones. Brendan Fischer, director of federal and FEC reform at Campaign Legal Center, said the US Office of Special Counsel acknowledged receipt of the first complaint and indicated that it would open a file on the issue.